Sports Camp Federation works with all types of organizations big and small to provide their participants special programs and products to enhance their experience. 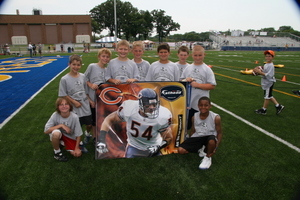 One such example was our work with Brian Urlacher and his football camps. We were approached by Brian and his people about assisting in his footbal camp in Lake Forest, IL. SCF came in and worked with Brian and his team to secure sponsorships for the camps, secure items to create a special gift bag for each camper and also get prizes to be given out at camp. Some of the participating brands were Vitamin Water, Nike, Topps, Quench Gum and Eye Black.com. Overall, all of the campers had an unforgettable experience and these brands had their products associated with the kids memories of the Brian Urlacher Football Camp.